It’s hard to believe that I’ve been selling professionally since 1988. I think I’ve grown quite a bit from my first sales encounter when I forgot it was important to actually ask someone to buy what they were looking for. Over the last 25 years, I’ve learned a lot and I’ve undergone tremendous change. I sat down the other day to think about what were the most important lessons I’ve learned, that both stand the test of time, and highlight the keys to success going forward. While I’m certainly no David Letterman, I thought I’d share the top 10 things I wish I knew before I got into B2B sales. 1. It’s not all about my personality. I said I was selling professionally since 1988. My mom says I’ve been selling since I spoke my first words, and for as long as I can remember, people have said to me that I would be a “natural” at selling. As my next lesson highlights, I firmly believe that there is no such thing as a “natural-born salesperson,” and I’ve learned that to be successful in selling, it takes far, far more than having a magnetic personality. I’ve also learned that I’d rather have introverts in key sales positions than extroverts. 2. You’ve got to do your homework. I hope my kids don’t read this post, because I’m going to admit here that I didn’t give my full effort in school. I was a big fan of the path of least resistance, and I hated homework. Hanging out with my fraternity brothers seemed like a lot more fun studying for my Managerial Accounting test. Then I started selling, and I learned there is no such thing as B or C grade. You win or lose, and there’s no value in finishing second. I realized that I was going up against solid competitors, and as the upstart, I was at a disadvantage. I knew I had to learn - and learn quickly. So I studied. I went on vacation with books and highlighters. I listened to tapes, took notes and practiced. I got to the point where I was pretty good at the selling portion of my job, but that didn’t mean that I could stop doing my homework. I had to study my market, my prospects and stay on top of my craft. Show me a salesperson willing to do their homework, and I’ll show you someone who will succeed. 3. Business acumen matters more than sales acumen. I think the biggest lesson hit me when I had mastered several sales techniques. I found that while they improved my performance, I still had to work harder and run faster just to keep up. I used to joke around that while I was spending all this time learning how to sell, buyers must have been taking training classes to learn how to stay ahead of sellers. The real game changer occurred when I came to understand that my business acumen was far more important than my sales acumen. The more I acted like a businessperson (and less like a salesperson) the better and faster my results. This was easy for me because I was always fascinated by business, but I’ve learned that not all salespeople are, and that’s a major obstacle for them. 4. Asking great question is better than giving great answers. When I started selling, my job was to provide good answers and demonstrate my product expertise. That stopped being valuable about five years into my career. Not that answers didn’t matter, but my customers and prospects didn't need me in order to get the answer. I learned that it is far more powerful to ask a great question than to have a great answer. It’s the person asking the question who controls the conversation, and it’s the company that controls the question that controls the market. 5. The ability to write is as important as the ability to talk. When I’m involved in hiring salespeople, I target the ability of the candidate to write clearly, concisely, and, at times, creatively, as a key indicator for whether or not I recommend a candidate. We all have a tendency to think of salespeople as talkers, yet writing is a crucial skill to success. Between emails, proposals and other follow up, salespeople are going to spend as much time writing as they are talking. The ability to write is also a clear indicator of one’s ability to think, and put thoughts together coherently. Content is increasingly crucial in winning sales, and salespeople need to be able to contribute to that process to be successful. 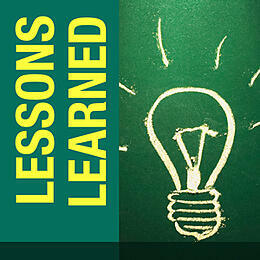 Check back on Monday to see the next five lessons I wish I knew before I got into B2B sales.